Why do some parents abuse their children? The short answer is that it is an interaction effect brought about by a number of factors, including outside stress (more stress equals shorter fuses); psychological issues in the parent (think “unresolved anger” from old wounds, often including the parent’s own childhood abuse); the child’s temperament (some kids are just more challenging than others); the parent’s attitudes about parenting; and the parent’s parenting skills. While effective parenting education in general can only do a little about the first three factors, it can be a very potent intervention for the last two. The following are five of the ways that an Active Parenting course can help prevent child abuse by improving the attitudes and skills that parents bring to the parenting process. Active Parenting teaches parents an authoritative style of parenting. One of the risk indicators in parents who abuse their children is a strong belief in the use of corporal punishment. The attitude that says children must be spanked into submission for their own good can escalate into psychological or physical abuse when a parent becomes angry and stressed over other issues in their lives. Teaching parents a model of parenting based on mutual respect and participation, the Active Parenting programs include non-violent discipline methods that correct misbehavior without the risk of morphing into abuse. 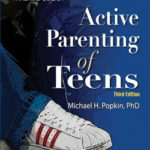 In Active Parenting 4th Edition, parents are not only taught “Eight good reasons not to spank,” but also skills such as logical consequences, “I” Messages, problem-solving, and other non-violent intervention techniques that offer a better, non-violent, alternative. Active Parenting teaches parents how to encourage, rather than discourage, children. One of the pioneering parent educators of the 20th century, Rudolf Dreikurs, once famously said that “children need encouragement like plants need water.” In addition to strengthening an attitude of encouragement in parents, Active Parenting teaches concrete parenting skills within parenting classes for how to encourage and motivate children. This means learning to increase positive comments that “build on strengths” (vs. focusing on mistakes); “showing confidence” in their child (vs. expecting too little); “valuing the child as he or she is” (vs. expecting too much). This is particularly important when considering that “inappropriate expectations of children” is another variable that has been linked to the risk of child abuse. Active Parenting teaches parents how to stimulate independence in children. A third predictor of child abuse is found in parents who “Restrict power and independence in children.” The authoritative or “Active” style of parenting is contrasted in Active Parenting with the autocratic (parent as “dictator”) and permissive (parent as “doormat”) styles. The dictator focuses on restricting a child’s power and independence through tight, limit-setting discipline that can escalate into abuse. The doormat also robs a child of power and independence through overprotection and doing for the child on a regular basis what the child can do for herself. The “Active” style of parenting is based on the concept of “freedom within limits.” It teaches parents to empower children through such methods as choice, participation, and problem solving within limits that are appropriate for their age and level of development. Active Parenting teaches parents how to empathize with children. “Low level of parental empathy towards children” is a fourth predictor of child abuse. Active Parenting is based on Adlerian theory, which might be seen as the predecessor to what is now called “cognitive-behavioral” theory. Adlerian theory has always been supplemented in Active Parenting programs with skills derived from communications theory and relationship-building training. The emphasis on teaching parents to identify and respond to children’s feelings is coupled with empathy-building activities to teach parents this essential parenting skill. New science on brain research shows that empathy (the experience of feeling what another person is feeling) releases the hormone oxytocin in both parent and child. This hormone, sometimes called the bonding hormone, creates a sense of well-being and trust. As such, empathy is a counter to stress that produces the hormone, Cortisol. Prolonged stress, such as is often suffered by abused children, can damage brain functioning and reduce the child’s ability to effectively handle stress. Active Parenting builds the parents’ own courage and self-esteem. Active Parenting does not claim to be therapeutic, but it does build character in both parents and children. Parents learn methods and attitudes that promote the building of responsibility, cooperation, mutual respect, courage, self-esteem and more in their children. It is not surprising that some of these lessons are also “caught” by the parents themselves. As one parent put it, “Active Parenting not only made me a better parent. It made me a better person.” Seeing oneself as improving is a hallmark of self-esteem (holding oneself in high esteem). Parents who see themselves as improving their parenting skills and themselves in general are less likely to become discouraged. Such parents are less likely to turn to abuse when their children’s behavior becomes stressful. Bavolek, S.J. (1980). Primary Prevention of Child Abuse: Identification of High Risk Parents. Educational Resources Information Center (ERIC). Dreikurs, R. & Stoltz, V. (1964). Children: The Challenge. Des Moines, IA: Meredith Press. Popkin, M. (2014). Active Parenting 4th Edition. Atlanta, GA: Active Parenting. Popkin, M. (2009). 1,2,3,4 Parents! Atlanta, GA: Active Parenting. Popkin, M. (2007). Taming the Spirited Child: Strategies for Parenting Challenging Children without Breaking Their Spirits. New York, NY: Simon and Schuster.